This flat topped hat pattern is one of my first designs. The unique woven top creates a different look for an otherwise normal style hat and the chunky brim adds a touch of dimension. 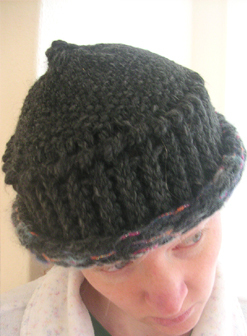 The hat pictured is made using Lion Brand Wool Ease Thick N' Quick yarn. Stitch Techniques: E-wrap, chunky braid stitch, weaving techniques and flat panel bind off.